Vedha Nayak knows the power of education. She also knows that, sadly, education is not an inherent right for all. That’s why she founded Behen, an organization that provides menstrual products to women in poverty, allowing them to continue going to school as usual. She’s since become a proud advocate for the U.N.’s Sustainable Development Goals, and even won the pitch competition at the U.N. Youth Assembly this past year. Somehow managing to juggle entrepreneurship, advocacy, school and work, Vedha is an inspiration to us all. When did you first become aware of the lack of knowledge surrounding menstruation in India? Why is educating women about their periods of such importance? At age fourteen, I stained my school uniform for the first time. The red splotch stared back at me as tears filled my eyes. “It’s just your period,” my mother said. “Don’t worry.” She was right; my life went on pretty much as normal. After numerous conversations with gynecologists, young girls and their mothers, I learned that many women from low-income families drop out of school when they start their period. Due to a lack of access to feminine hygiene products, they sometimes use alternatives like leaves, dirty rags, and even cow dung. Apart from resulting in many health issues, this also severely reduces the quality of life. High rates of school absenteeism and dropouts cause a harmful cycle of illiteracy, unemployment and poverty. Teaching women about the importance of menstrual health can help them break out of this cycle. 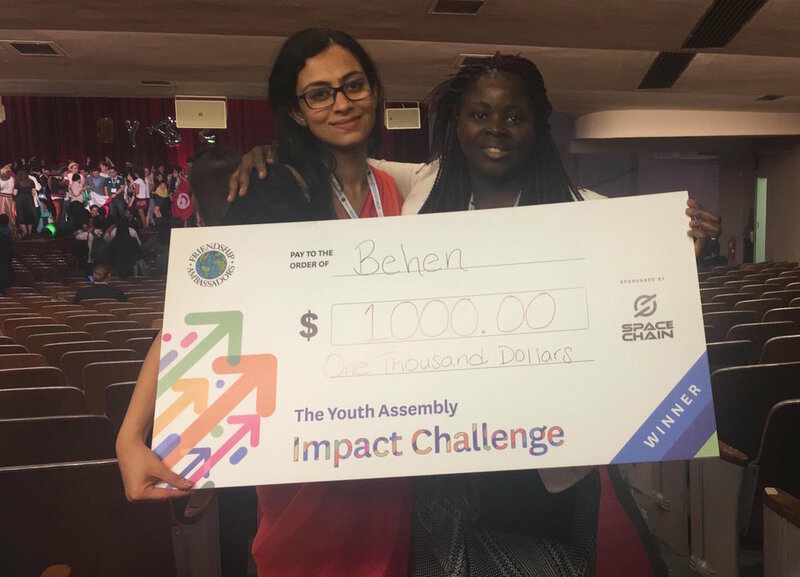 You co-founded the social enterprise Behen in February 2018. What is the general aim of Behen and what goals do you hope to attain in the next 5 years? Behen employs a community-based framework to sell reusable menstrual underwear in India with the primary intention of promoting gender equality and protecting the environment. We intend to achieve these goals by hiring women from a local domestic shelter to assemble, package and sell our product, and for each underwear sold we’ll donate one to a woman who cannot afford it herself. At Behen, we believe that every woman in the world deserves to be safe, healthy and, above all, to feel human. To achieve this vision, we’ll distribute 1000 pairs of underwear and employ 50 women by mid-2019. Over the next five years, we’ll scale our operations to different cities, with the hope of creating a reliable and replicable framework that can be adopted by other countries with similar issues. On a personal level, my goals for the next five years include completing my degree at Miami University, obtaining a masters degree in international relations, and working with the United Nations. More importantly, however, I hope to become a role model for my little sister and other young women around the world. I hope to show them that if we believe in ourselves, we can achieve all our dreams, just like my mother showed me. What has been the biggest challenge so far in starting your own social enterprise? How have you learned to balance academics and other commitments alongside working on Behen? I think, ironically enough, the biggest challenge has been my own menstrual health. As a woman with polycystic ovarian syndrome, the extremely painful cramps and mood swings sometimes make it hard to get everything done. It also leads to another huge challenge that I’ve faced: time-management. Often, I find myself struggling to balance academics, extracurriculars, social events, and my work as a Resident Assistant and co-founder of Behen. Sometimes, I’m not able to give my 100% to all of the work that I commit myself to. Within this context, however, I’ve learned that taking a step back helps in those moments. I’ve learned to see life as more of a marathon than a sprint. To be able to succeed, we have to plan better and allow for moments of recovery after expending energy. Why do you think is it important to address issues like menstruation worldwide and publicly? How do you hope to have these issues be addressed? As a delegate at the 22nd UN Youth Assembly this past August, I had the opportunity to participate in the YA Impact Challenge. This allowed me to pitch the idea for Behen in front of experienced entrepreneurs and hundreds of young change-makers from across the world. After the final pitch competition, many young women told me that they felt a strong connection to my project because they’d faced similar issues in their home countries of Sierra Leone, South Africa and Nigeria. They want to help out with Behen’s operations and partner with us to expand the project because to them, Behen represents a revolution. When I was announced as the winner of the competition, I realized that my project wasn’t just mine anymore'; I had the support of women from across the world. The spirit of a shared experience allowed us to understand that, if we hope to erase the stigma, we must talk about menstrual hygiene publicly. And as my experience at the Youth Assembly proves, the best way to do this is by supporting, collaborating and cooperating with each other. How can college women like you advocate for Sustainable Development Goals? The biggest thing is to find out what’s most important to you. All of us have a story -- we’re passionate about solving different issues and problems. Find yours, and then get connected. Look up people who are doing things that inspire you and reach out to them. Get involved with local NGOs and organizations. If you can’t find something that speaks to your heart, set up your own organization! Help people in whatever way you can and, in turn, they will help you. Essentially, build a quality network and support system. Above all, however, always believe in yourself. As young women, we often think that our work is too little to make a difference. And, although you might not eradicate poverty or solve world hunger overnight, every step you take and each life you impact does matter! I’d change the education system. To me, the high-school education system in many countries doesn’t serve the purpose of preparing young children for the workforce. I hope that in the future, we are able to create a holistic model of education that teaches the importance of technical skills as well as soft skills. In a rapidly changing environment with high-stress levels, we need a system that emphasizes the importance of learning to adapt and be mindful. Who has been a role model to you in your life and inspired you in your work up until now? My parents. They’re my biggest cheerleaders, and although they might not realize it, I’m immensely inspired by them. Over the course of my life, I’ve watched them set up multiple businesses, battle health issues, stand by each other during tough times, fail and succeed, but in every situation, they’ve always helped other people. From them, I’ve learned to have difficult conversations and stand back up every time I fall. I’ve learned to give my best to everything that I do. And (we often joke about this at home) I’ve also learned that a good cup of tea can solve almost any problem. I see myself as an enthusiastic and curious learner because I’m not afraid of failure. As a leader and teammate, I’ve developed the ability to be empathetic and inclusive in my interactions with others. Within this context, I’m a listener, a motivator, and an innovator.